Veda is a Sanskrit word which means ‘Knowledge’. Using regular mathematical steps, solving problems sometimes are complex and time consuming. 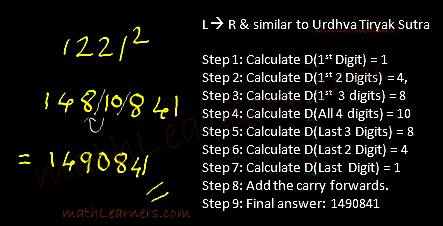 But using Vedic Mathematic’s General Techniques (applicable to all sets of given data) and Specific Techniques (applicable to specific sets of given data), numerical calculations can be done very fast. Mathematics enthusiastic always have the questions What is Vedic Mathematics and What are the . Techniques/Sutras in Vedic Mathematics. But when they try to go through the Vedic Mathematics books they get confused for some of the techniques, concepts and to understand this they search on internet. I found that not much information of Vedic Mathematics Sutras/Techniques is present over the internet. By referring original book of Vedic Mathematics by Tirthaji Maharaj, I have tried to mention the Vedic Mathematics Sutras in a simpler and with step by step approach. I have solved lot of examples to make Vedic Mathematics Tricks understandable. 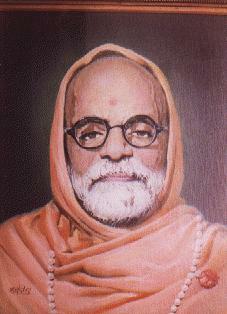 Shri Bharathi Krishna Tirthaji Maharaj was born in March 1884 in the Puri village of Orissa state. He was very good in subjects like mathematics, science, humanities and was excellent in Sanskrit language. His interests were also in spiritualism and mediation. In fact when he was practicing meditation in the forest near Sringeri, he rediscovered the Vedic sutras. He claims that these sutras/techniques he learnt from the Vedas especially ‘Rig-Veda’ directly or indirectly and he intuitively rediscovered them when he was practicing meditation for 8 years. Later he wrote the sutras on the manuscripts but were lost. Finally in year 1957, he wrote introductory volume of 16 sutras which is called as Vedic Mathematics and planned to write other sutras later. But soon he developed cataract in both of his eyes and passed away in year 1960. Vedic Mathematics can definitely solve mathematical numerical calculations in faster way. Some Vedic Math Scholars mentioned that Using Vedic Maths tricks you can do calculations 10-15 times faster than our usual methods. I agree this to some extent because some methods in Vedic Mathematics are really very fast. But some of this methods are dependent on the specific numbers which are to be calculated. They are called specific methods. Lets take 1 example to see the Power of Vedic Mathematics. 1/19 is a Rational Number which forms a recurring decimal number and which recurs the sequence after every 18 digits. How much time will you take to divide 1/19. Using Ekadhikena Purvena Sutra of Vedic Mathematics, It would take just 7-8 seconds to calculate exact decimal number in just 1 line. Gaurav Tekriwal, Founder of vedicmathsindia.org on Quora, mentioned below The Use of Vedic Mathematics. More than 1700% times faster than normal Math: this makes it the World’s Fastest. • Eradicates fear of Math completely. So If your child has Math-Phobia High Speed Vedic Math is a Fun-Filled way to do Math and arises interest in your child. • Much Improved Academic Performance in School and Instant Results. Just see the first exercise and believe it for yourself. Go over the examples given in the tutorials you would be amazed. • Sharpens your mind, increases mental agility and intelligence. • Increases your speed and accuracy. Become a Mental Calculator yourself. • Improves memory and boosts self confidence. • Cultivates an Interest in your for numbers. • Develops your left and right sides of your brain hence using intuition and innovation. It has been noted that Geniuses have been using the right side of the brain to achieve exceptional results. • Easy to master and apply. You just need the knowledge of tables to learn this. Vedic Maths Techniques/Sutras have the maths tricks for fast calculation and can be used in exams like CAT, CET, SAT, Banking Exams, etc. Let’s have a look at some of the techniques used in Vedic Mathematics. 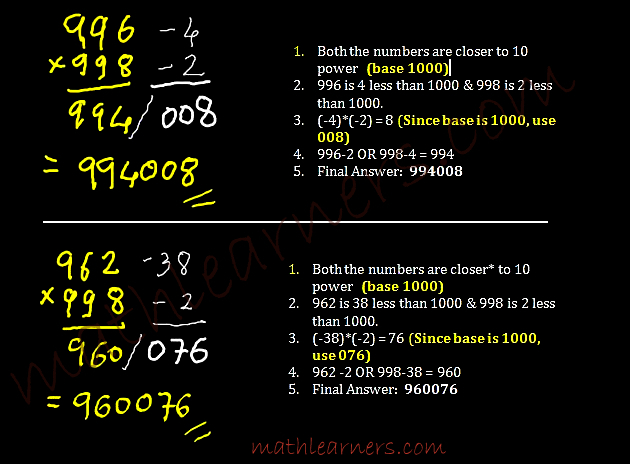 Using Vedic Maths Tricks you can multiply 962 and 998 in mind in couple of seconds. 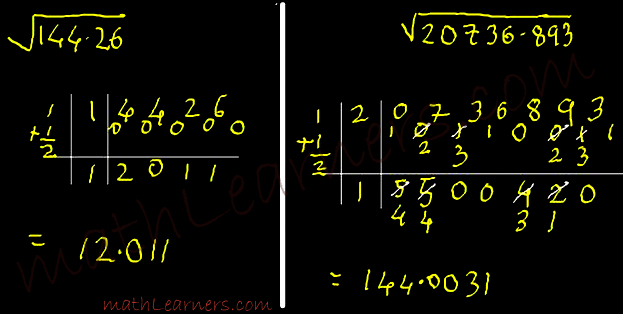 How much time will you take to calculate square of 1221. How would calculate Square Root of 20736.893?? Using Vedic Mathematics its 4 step method. It has been a very controversial subject especially with the name of the book. Many Indian scholars thinks that name of this book should be different than “Vedic Mathematics” for various reasons. But we wont go into these details, rather use the same name which is famous all over the world and make use of techniques which are truly amazing, simple and most importantly less time consuming. Hello , I do believe this is an excellent website. I stumbled upon it on Yahoo , I’ll return once again. Namskar, Vedic Ganit Marathit Upalabdha Vhave . Hi Vinnanti Dhanyawad. Namaskar, khupch uapyogi aahe Vedic Ganit .Dhnyawad.